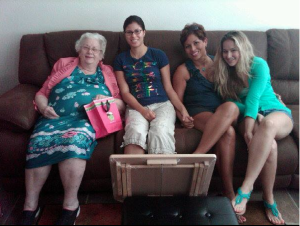 Jennifer and Jasmine Hesterman, along with their mother, Janethe, visit with Naomi Hesterman. Jenny and Jazzy have always liked to visit their grandmother. On Sept. 15, the sisters and their mother, Janethe Hesterman, made the drive to do just that. The girls listened to my mom as she shared her trademark stories. Jazzy commented on my mother’s outfit saying she thought her pink jacket looked cute with her dress. Jenny sat close to my mom, whose arm was around her for most of the visit. The girls, who hadn’t seen her in a while, wanted to bring a gift, Janethe said, as she reminded her daughters to get it from the car. It turned out to be two gifts: some lotion to ease the dryness of diabetic skin and a small table suitable for use when snacking while watching television in the living room. Her guests appeared to be, as well. Thanks, Jenny, Jazzy and Janethe. She loves the attention.